Whether you're a publisher or regular pioneer, how you present yourself is key to a successful ministry. The importance of coming across as neat and organized cannot be overstated in this endeavor. Not only does a professional manner make you instantly more credible, but you will also find that your job is much easier when everything is readily at hand. At Ministry Ideaz, we strive to make your ministry goals more attainable and the All-In-One Preaching Folio, along with the Universal Tablet + Watchtower Folio, is the tool to help you do just that. With space to hold all the materials you need, from record slips, pens and tracts to a variety of miscellaneous items, the leather Watchtower folio is perfect for keeping everything you need in one place. There are 5 plastic pocket pages to house brochures and magazines, another four pocket pages made especially for holding tall tracts, and yet two more for holding the original kind. Get to know these features in more detail here. The folio, available in many beautiful colors, even has a spot at the front made especially for your New World Translation Bible. But best of all, the new style will even hold your tablet! Talk about consolidating! With our ministry now focusing on the use of the jw.org website and all of the videos, our ministry efforts in the 21st century now include the aid of an iPad, Galaxy Tab or another smart tablet – and rightfully so. These new gadgets have gone a long way in making our work as Jehovah’s Witnesses more effective and efficient. This of course does not replace paper ministry supplies entirely as there is still plenty of use for them. For instance, having magazines and tracts on hand to give to interested persons is a necessity. Combine the new ways with the tried and true, by adding a smart tablet to your arsenal of ministry materials. 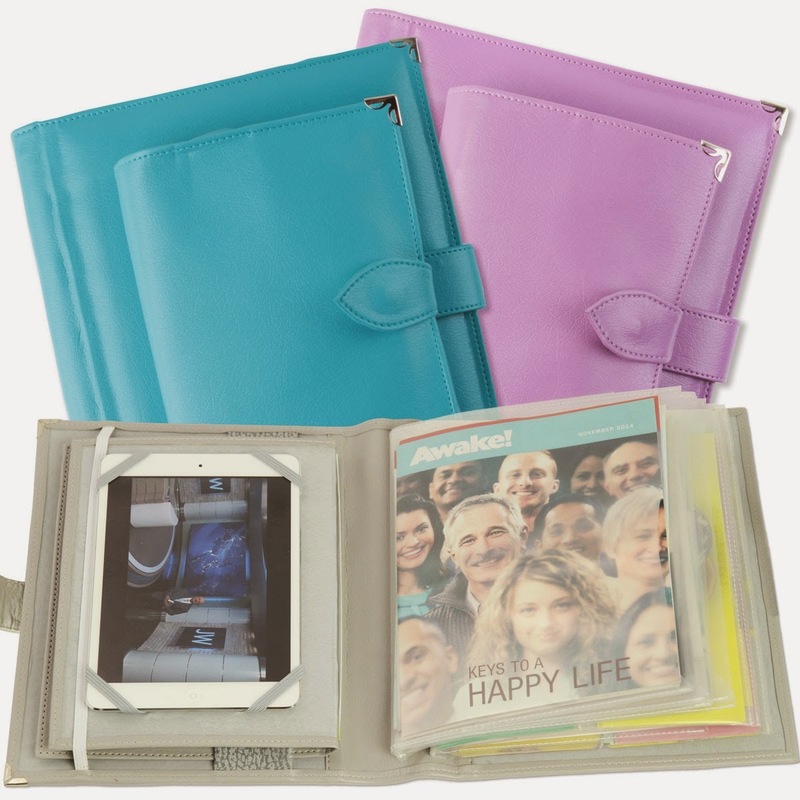 With the Universal Tablet + Watchtower Folio accessory, consolidation is still easy! 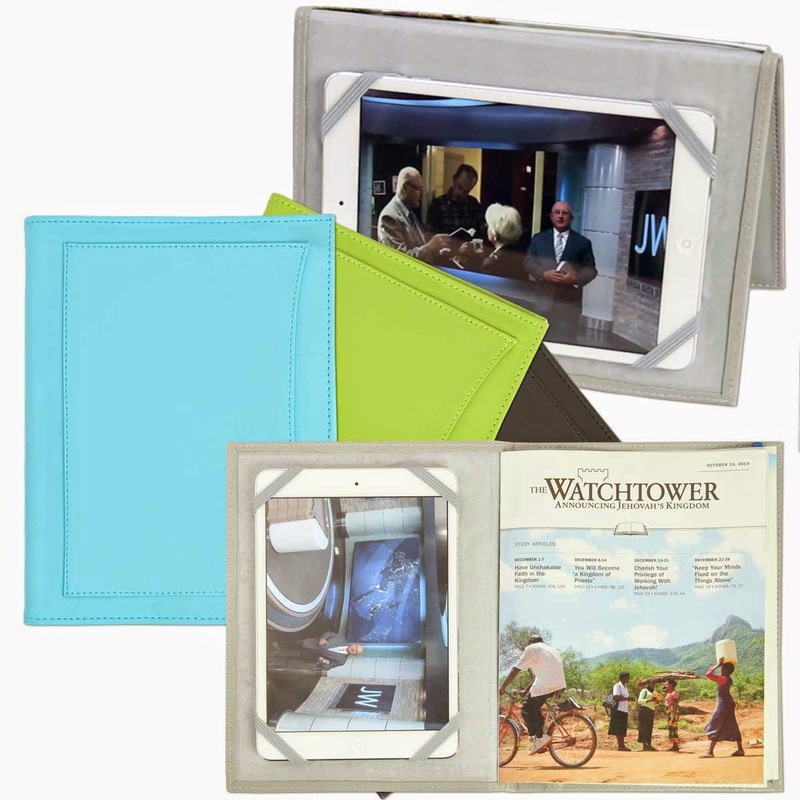 Designed by Jehovah’s Witnesses to cater to our needs as required by our ministry efforts, this brand new accessory not only protects your smart tablet, but it also makes presenting videos and other viewing material to your audience much easier. It features additional space for even more documents. Did we mention that it’s a universal tablet holder? Available in various sizes, it can support all but a small handful of smart tablets from the iPad Air to the Galaxy Tab 4. Learn more about sizing and features here. Being equipped with the proper resources is the first step toward fulfilling your ministry as one of Jehovah’s Witnesses to bring the Truth to even more people. Ministry Ideaz is here to provide you with these resources and we love to hear your words of inspiration and encouragement throughout our blog. Have our products assisted you? Let us know how you're helping to spread the God's Word to the furthest recesses of the world in the comments below. Please visit: http://goo.gl/xw6Cs3 if you're interested in purchasing. Hello! I'm from Ecuador. How can I get one? Thanks for writing, Michelle. That's awesome! We actually ship from Ecuador. So it will be very easy for you. Please visit: http://www.ministryideaz.com/The-Basics-Service-Folio-with-tablet-holder-p/wt9u.htm if you're interested in purchasing. Choose Ecuador as your country when checking out and we'll ship it with Correos del Ecuador. P.S. Michelle: Try : http://goo.gl/xw6Cs3 if the above link doesn't work. tthis website and at the moment this time I am visiting this web site annd reading very informative content at this time.